Our basic area of research involves the synthesis, characterization and spectroscopy of lanthanide doped nanoparticles. Of particular interest are upconverting nanoparticles that are capable of converting near-infrared into visible light (see figure below). These materials have attracted considerable attention due to their potential application as biolabels and in biological assays. Nanoparticles doped with lanthanide ions that emit in the infrared are also attractive to the telecommunication industry. These materials are particularly robust and resistant to chemical and photo-induced degradation making them ideal for these applications. The use of oleic acid in combination with the non-coordinating solvent octadecene for the synthesis of various types of nanoparticles is well documented. We have developed a new synthetic route based on this method that provides highly crystalline and luminescent lanthanide-doped cubic NaYF4 nanoparticles capable of being collodially dispersed in nonpolar solvent (e.g. hexane, toluene, dichloromethane). By varying various synthetic parameters we are able to tailor the size and shape of the synthesized nanoparticles. The synthesized particles are thoroughly characterized in terms of their physical characteristics and spectroscopic properties. Physical characterization entails powder X-ray diffraction to determine the crystalline phase and crystallite size; low and high resolution transmission electron microscopy (TEM) along with atomic force microscopy (AFM) to examine sample morphology and individual particle size; and reflectance Fourier transformed infra-red spectroscopy to detect the presence of surface species. 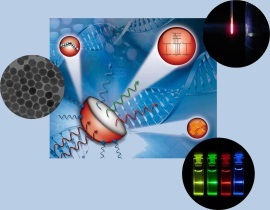 Dynamics, luminescence efficiency and high resolution spectroscopic measurements on the dispersed nanoparticles enable us to understand the size dependence of the spectroscopic properties. We have experience and are fully equipped to synthesize numerous lanthanide doped nanomaterials for optical applications. Our lab is equipped to perform high resolution laser excited total luminescence, excitation, fluorescence lifetime measurements, laser induced fluorescence line narrowing, time resolved site selection spectroscopy, and Raman spectroscopy. We are capable of performing these measurements at various temperatures ranging from liquid helium temperature (4K) to 500K. The numerous laser sources available allow for excitation with wavelengths from the NIR to the ultraviolet.